The Glasstic Styleᵀᴹ Design Pack contains our 5 top design style inserts: Love, Peace, Tribal Yin Yang Purple, Tribal 2 Red & Black and Retro. 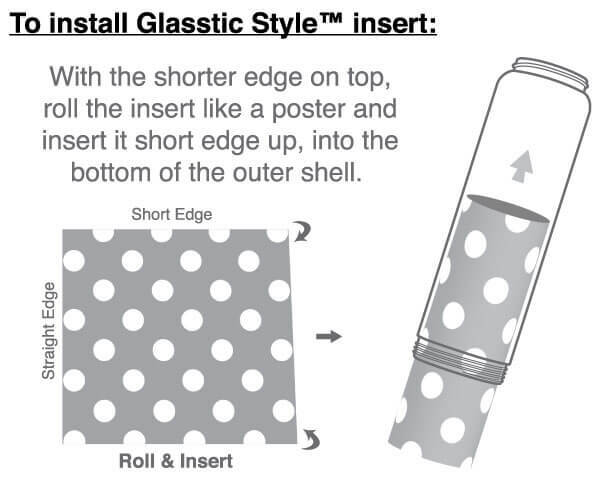 Purchase the Glasstic Styleᵀᴹ Design Pack and pay $1.00 each. That is a 50% Savings over purchasing them individually! The Style Inserts are lamintated to make them waterproof. Replacements are freely available. Disclaimer: The four design bottles - Peace, Retro, Tribal Yin Yang and Love are not ideal for use with the Glasstic Styleᵀᴹ inserts as the designs are printed around the outside of the protective shell, making it difficult to see the Glasstic Styleᵀᴹ insert which is placed on the inside between the outer shell and glass insert. For this reason, we recommend using the Glasstic Styleᵀᴹ inserts with the regular branded or custom design logo bottles.